The underwear we put to the test today is the boxer brief from the very first collection of Matt James Underwear. The brand is quite new since it started its journey in February 2018 but, based on my impression, it has laid the foundation for a promising future. Based in Cheshire, UK, Matt James Underwear launched its first collection which consists of boxer briefs designed with passion for comfort and quality for all men, offering support in their everyday activities ranging from work to gym. The colour I tested is the white one with black waistband, but apart from this combination the brand also offers three more: white with silver waistband, black with black waistband and black with silver waistband. Starting from the packaging, it is clear the company has elevated its work to a high professional level. More specifically, every pair comes with a tin packaging with the Matt James logo printed on it. The tin can be used in many different ways, since its size can fit anything, from a small towel to a bunch of protein cookies -for those seeking a little treat after workout-. The brief has a classic cut and enough space for my thighs, a feature that I look for when reviewing underwear. Also, it has a nice, wide waistband with a centered Matt James logo at the front. The fabric is a classic 90% cotton and 10% elastane blend which I mostly admire but not applaud. The reason? The existence of other fabrics, like modal, that outperform cotton and keep me cool and dry even under demanding situations. However, I must admit that cotton is a widely used material with satisfying performance. Talking about performance, what wouldn’t be wiser than wearing the boxer brief at the gym during a hot afternoon in Greece? Despite the hot and moist air at the gym this pair of underwear performed really well absorbing my sweat, which was more than a couple of drops! Additionally, it stayed in place, even when I tried deep front and back squats, which is a “thumbs up” for the boxer. Also, it kept supporting me during my leg workout and it was one of the first times that I appreciated the extra fabric on my thighs since I am a more of a briefs fan. Design-wise, I was expecting a contoured pouch at the front. As you can imagine, this did not happen and the absence of the contoured pouch is inextricably linked with less support on our precious treasure down there. In addition, the boxer is high rise, a fact that is acceptable for me at the gym but I have a tendency to wear low rise underwear in my everyday life. It should also be mentioned that inside, at the back, there are two stitched labels, but one of them is stitched only on one side. As a result, this extra piece of fabric, despite the fact that is soft, it can rub against your skin. Moreover, according to the care instructions label, you cannot iron this underwear so you cannot easily keep it straight. In my case, even though the second label was folded and slightly creased, I did not have any discomfort issues. Next thing after the workout was to, of course, wash the underwear. 40 degrees did not have an impact neither on the fabric nor the waistband. The shape and feel after the laundry was the same, apart from some broken threads at the back of the waistband. 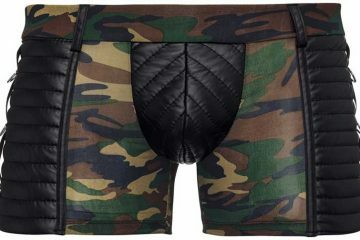 All in all, I am satisfied with Matt James first boxer brief from a design and a performance point of view. However, I insist on adding a contoured pouch on their next collection of underwear. Finally, I can’t skip mentioning my excitement, for the great packaging and the multi-purpose tin. Would I recommend it? Almost yes for an everyday use and definitely yes for the gym!